Philadelphia Freedom, I loooooove you... Yes I do. Swiftly approaching our last few hours in Philly and I am right where I want to be: sitting on the couch enjoying a little downtime with my dude, mentally prepping for our last dinner in town before heading home in the morning. This week has been awesome. We've been running around like mad, with days and nights coming in mini-series split between Philly and NJ. We have eaten many delicious things. Some twice. We have visits, frolicked, tripped down memory lane, snuck in a little nooky here and there and generally, had a lovely time. I forget how lucky I am sometimes. Having my friends and family point out things about my dude or the way we are together reminds me how lucky I am. He is nice, he pays attention, he relaxes and stays himself, he's affectionate and makes me feel comfortable doing all the same things in return. That may sound a lot like, Well, duh! territory but I've been in a few relationships where I felt constantly at odds with my own desires, shut out or down by my partner, more concerned with whether or not they would shake loose of my displays of affection. It's a nice change. Sometimes I'm so happy I take it for granted. Not altogether awful. -met the parents, all my step brothers and 9 good friends. Whoah. -ate at Han Dynasty in Old City and, oh, I just love it so much...! -oh, and, Dude got his very first tattoo! Making him the sexiest creature on the planet. I am not allowed to reveal photos of his tattoo yet. But I got a new one, too! The picture isn't great, but it's still amazing to me that I can keep up with my blog on the go from just a tablet. Awesome. 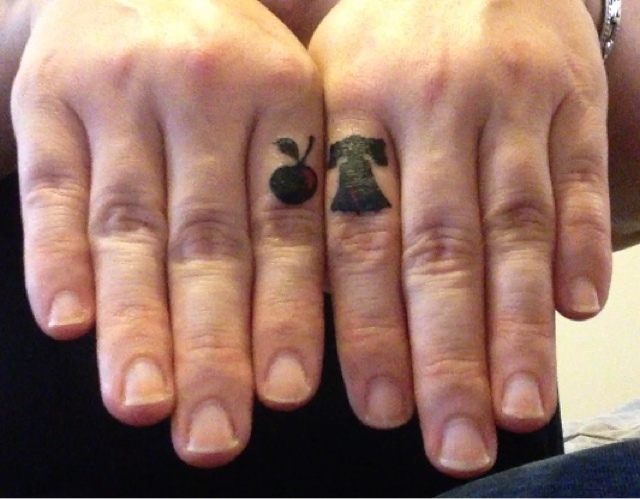 My newest tattoos are a Liberty Bell and a cherry. A little Philly and a little Minneapolis. One of my other tattoos is a Claus Oldenberg scultpure, The Embrace (aka The Clothespin) which lives over the entrance to Suburban Station in Philadelphia. Minneapolis boasts a fine Oldenberg of its own: The Spoonbridge Cherry which consists of an enormous spoon with an equally enormous cherry sitting in its bowl. The stem sprays water over the handle and the whole work lives in the Walker Sculpture Garden. So, a cherry for my new home, and the bell for my roots and my freedom to explore the world. Having a wonderful time, but can't wait to come home! Newer PostVacation exercise. Or not. Older PostLittle Fitbit, you intrigue me.